VANCOUVER – Dylan Armstrong can’t remember the last time he hasn’t thrown the shot put at the Harry Jerome Track Classic. 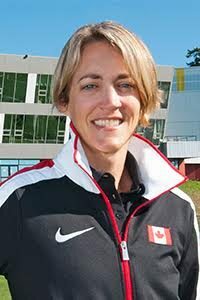 “Oh geez, probably the last time they didn’t have shot put,” the Kamloops native and two-time Olympian said Thursday. That’s at least a decade. But even though the six-foot-four, 300-pound giant is sidelined with a wonky right elbow that will need surgery, Armstrong still received a medal at Burnaby’s Swangard Stadium – bronze from the 2010 International Amateur Athletic Federation in Qatar. Armstrong finished fourth there, just behind Andre Mikhnevich of Belarus. But the Belarussian had all his results expunged last year after the IAAF tested samples taken at the 2005 world track and field championships and found that Mikhnevich and four others were guilty of using banned substances. Armstrong said last year he definitely knew some of his competitors, particularly those in the old Soviet bloc countries, were using banned substances. It has taken more than a year to finally get his medal because “it was quite difficult to get,” says Armstrong, with a nod to the politics involved with the Belarussians and the IAAF. It’s believed the medal he received on Thursday was a replica of the ones that were awarded in 2010. Armstrong won silver at the 2011 world outdoor championships and bronze at the 2013 championships in Moscow. He also finished fourth at the 2008 Beijing Olympics, just a centimetre behind Mikhnevich, the bronze medalist. Armstrong is expected to eventually be rewarded with an Olympic bronze, but getting that one is proving to be an even more complicated process. The Canadian Olympic Committee is working on his behalf, dealing with the IOC. Armstrong has battled below troubles for the past couple of years and competed while in pain at London in 2012 where he finished a disappointing fifth. Armstrong, who last threw in early May before shutting down for the season, is expected to have surgery within the next month to grind the bone down and deal with the arthritis. Rehab will take five to seven weeks. He does plan to compete at the 2015 world championships in Beijing and then take one more crack at earning an Olympic medal in Rio in 2016. “(The elbow) really started acting up in April and I just thought I’m not going to push this. I’m not getting any younger. And if I don want to have a good chance at getting on the podium in 2015, 2016, this is the year to take care of this. Armstrong says he doesn’t regret not getting the surgery earlier. “It was okay. I won a medal in 2013 . . . with a bent arm, so I was kind of on a high and training was going really well (early this year). But that’s the funny thing with elbow spurs. They act up. They kind of go up and down and you can’t predict. They’re floating around. The gregarious Armstrong says he’s been staying in aerobic shape with some light jogging and some road cycling, which must be quite a sight given his size. And he says the rest after a decade of throwing and hard training hard might be mentally good. He wants to be a lighter before the surgery and for the start of next season.